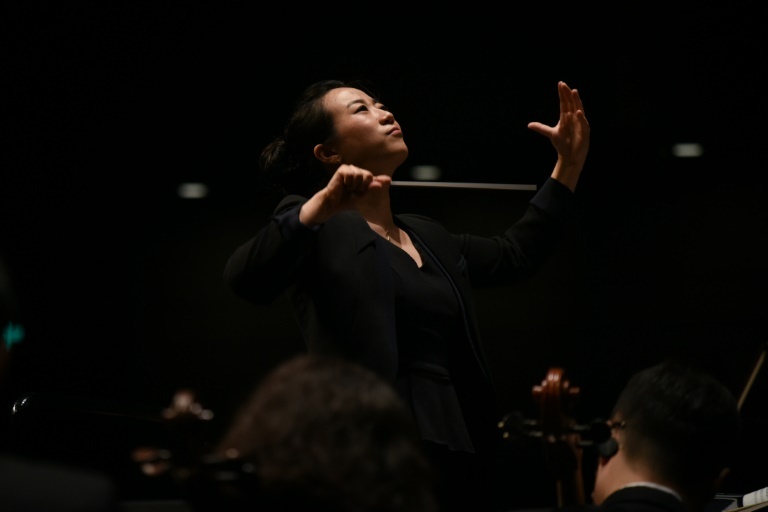 Jing Huan twirls her conductor’s baton nervously in the wings while the brass and string sections of China’s Guangzhou Symphony Orchestra tune their instruments. Aged 36, Jing is part of a new breed of foreign-trained conductors, as China hopes to gain recognition in the field after winning global fame for its soloists, including piano and string virtuosos. After long relying on Western conductors, a growing number of symphony orchestras around the country are now entrusting the baton to a fresh generation of Chinese music directors. Jing studied at the University of Cincinnati and served as the conducting assistant of the symphony orchestra there before joining the Guangzhou orchestra in southern China. Last year her orchestra performed on a prestigious Beijing stage as part of a “musical marathon” that saw nine ensembles play one after another to mark the 20th anniversary of the Beijing Music Festival. “In China, in the Central Conservatory of Music, we focus on technique,” she told AFP. “So technically, we are very strong… but as a young conductor you don’t have many chances to conduct a real orchestra immediately in China, while in America, it’s easy to get a lot of experience early on,” she said. According to prominent music critic Xu Yao, there are now some 80 symphony orchestras in China — backed by local governments who see Western music as a matter of prestige — compared to about 30 just eight years ago. “But the shortage of conductors remains: most orchestras are led by Chinese, but one conductor can sometimes be in charge of three orchestras!” said Xu, pointing to the lack of “small musical groups” that would allow young conductors to gain experience, as is the case in the West. China has come a long way however, said Long Yu, 54, artistic director of the Shanghai and Guangzhou symphony orchestras, and founder of the Beijing Music Festival. “I grew up in Shanghai in the midst of the Cultural Revolution,” a period of political turmoil from 1966-1976 during which Western music was banned, the maestro told AFP. Long secretly learned the piano from his grandfather, a renowned composer, and in the 1980s became one of the first Chinese musicians to study abroad as the Communist government started to open up to the rest of the world. He trained in Berlin before returning to China in the early 1990s, where conducting remained difficult. “It is a very special job. You have to deliver a message on the interpretation of the music to the musicians themselves, so it’s quite difficult,” he said. Long bristles when he hears about a “Chinese style” of playing classical music. “There is no such thing as a Chinese-style Beethoven!”, he said. Conducting in China still carries its special challenges — and rewards, said violinist Jian Wang, who also trained in the United States. “It’s very interesting and challenging at the same time to play in China (because) part of the audience is hearing the pieces for the first time,” she said. In addition, most musicians in Chinese orchestras were trained as soloists. Ten years ago, French conductor Emmanuel Calef came up against the problem when he took the podium with the Guiyang Symphony Orchestra, a private venture in the remote southwestern province of Guizhou. Musicians in their 20s “were technically ready, but not culturally ready, and they had not been trained to participate in a collective endeavour”, he told AFP. He also remembers the “cultural shock” he felt when he found that neon signs would light up to indicate to the audience when to applaud. And while rich businessmen who financed the orchestra were ready to rent a prestigious Steinway piano or a precious Amati violin, they were reluctant to buy quality scores, the French conductor said with a smile. Ten years on, classical music is no longer seen in China as an “import product”, although the repertoire is often confined to the “very big” composers such as Beethoven, Bach and Brahms, said Calef. For more modern composers, “some (Chinese) musicians have similar reactions that their Western counterparts had when discovering the scores in the late 19th or early 20th centuries,” he said. For him, the real difficulty is that few Chinese conductors have won plaudits abroad. Notable exceptions include Chinese pioneer Tang Muhai, who conducted the Berlin Philharmonic during the 1983-1984 season, then continued a successful career in the US, Portugal, Australia and Finland. There are other examples like China’s Zhang Xian, who in 2009 became the first female musical director of a symphony orchestra in Italy, in Milan.